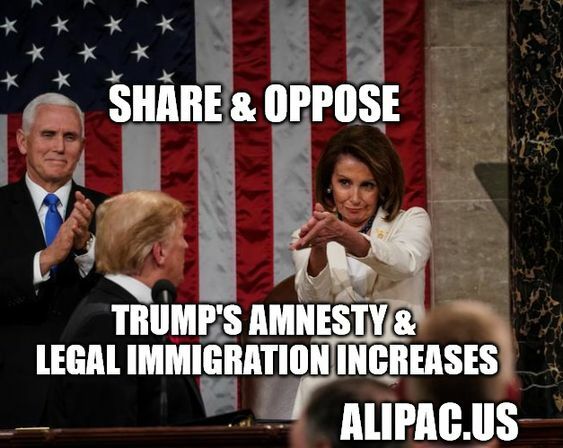 Americans for Legal Immigration PAC (ALIPAC) has surveyed the national organization's supporters by e-mail and social media, and found more than 95% oppose Trump's plan, announced during his State of the Union address, to increase legal immigration levels beyond our current historically high rate of 1.6 million per year. At 1.6 million per year, America already allows more people to legally immigrate than all other nations on the Earth combined. The US Census Bureau is projecting that current high levels of legal and illegal immigration, and growth of those families, will add 75 million people to the population of the United States by the year 2060, representing 95% of America's population growth. Many ALIPAC supporters are Trump voters who are very disappointed and alarmed to learn of Trump's reversal on yet another core campaign promise on immigration issues. Trump's announcement supporting increasing current legal immigration levels, made during his State of the Union speech, is being added to ALIPAC's tracking list as Trump's 11th broken campaign promise on the immigration issues that got him elected. This shocking reversal is disappointing many Trump voters who are becoming increasingly skeptical about Trump's deployment of his liberal scandal ridden son-in-law Jared Kushner to cut Amnesty deals with Democrats, about Trump's allowance of illegal alien caravan members into the US, and about his 2020 reelection chances. "Trump continues to say and tweet things American conservatives want to hear, but then pursues policies that contradict his verbal promises," said William Gheen, Presdient of ALIPAC. "Americans deserve more honest and consistent leaders than this, and Trump's support for increased legal immigration levels and Amnesty for millions of illegal aliens will turn America into a socialist country by handing the Democrats a permanent monopoly over future US elections, laws, and all branches of government." Legal immigrants and illegal immigrants who vote in US elections are more than 90% likely to vote for Democrats and that is why Reagan's disastrous Amnesty of 1986 turned the Republican state of California into a permanent Democrat socialist stronghold. Reagan's legislative Amnesty for 1 million illegals was awarded to 3 million illegals, which is why America now suffers from more than 20+ million illegal aliens within our borders. This is why ALIPAC opposes Trump's plans to pass a new mass Amnesty bill, larger than Reagan's, by February 15, 2019, and opposes Trump's plans to increase legal immigration levels beyond America's current historic and destabilizing levels. For more information about how illegal immigration and hyper-legal immigration are harming Americans, please visit www.ALIPAC.us. Last edited by ALIPAC; 02-07-2019 at 01:30 PM. Beezer, GeorgiaPeach and MW like this. Congress plans to fast track an illegal alien Amnesty + legal immigration increase bill by Feb 15. Call on Congress now (Numbers HERE) to oppose Trump's Amnesty and legal immigration increase plan ASAP! Survey: Do you support Trump's call to increase legal immigration levels?